Calgary, Alberta (UPI) Apr 17, 2013 – The approval of an export license for Triton LNG Ltd. from a port in British Columbia gives Canadian energy companies access to new markets, a regulator said.Canada’s National Energy Board gave approval for a 25-year application to send about 320 million cubic feet of liquefied natural gas per day from a port to be located either at Kitimat or Prince Rupert, British Columbia.NEB said the approval is in response to the glut of natural gas in North America. Canadian Prime Minister Stephen Harper has sought to add a layer of diversity to an energy export economy that depends on the United States. Asian markets are among the world’s largest consumers of LNG and Harper recently signed a free-trade deal with South Korea. NEB said the terminal for LNG hasn’t been constructed yet and needs further regulatory approval before it can begin. The provincial government in Alberta, Canada, said it set aside more than $1 billion for carbon storage and storage facilities for oil sands projects. Provincial Energy Minister Diana McQueen said two projects tied to the oil sands sector would be able to store more than 2.7 million tons of carbon dioxide each year. “With [these projects], we are showing the world we take the responsible development of our resources seriously and we’re becoming a world leader in CCS technology,” she said in a statement Thursday. Alberta holds some of the largest oil deposits in the world at its Athabasca deposit, located in the east of the province. The heavier grade of crude oil found there is seen as a threat to the environment because it’s carbon-intensive to produce. The Canadian government touts Alberta’s oil sands as the third-largest proven crude oil reserve in the world, next to Saudi Arabia and Venezuela. 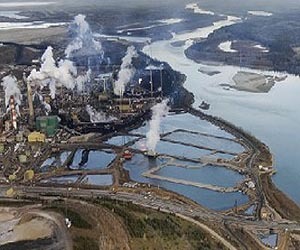 The region’s heavy crude oil is mixed with clay, bitumen, and a good deal of sand — hence the name “oil sands.” This makes for a unique and energy-intensive extraction process that some scientists say produces three times the greenhouse gas emissions of conventionally produced oil. Environment Canada has said it expects production emissions from tar sands to hit 104 million tonnes of CO2 by 2020 under current expansion plans. CNRL pipeline leaks 70,000 litres near Slave Lake and Burnaby, B.C., is standing up to Big Oil. British Columbia city challenges oil pipeline: What about fire or leak? Burnaby, B.C., is standing up to Big Oil. The Vancouver suburb wants to know where a proposed oil pipeline is going to go, especially if Burnaby fire crews are expected to handle a leak, rupture or conflagration. The big, Houston-based Kinder Morgan pipeline company wants to double the capacity of its existing Trans-Mountain Pipeline. The pipeline transports crude oil from Alberta beneath the city of Burnaby (population 202,000) to a refinery on the shores of Burrard Inlet. Tough questions from Burnaby deserve attention south of the border. Expansion of the Trans-Mountain Pipeline has one major purpose — export of oil by tanker through international waters of the San Juan and Gulf Islands out the Strait of Juan de Fuca. Destination: Asia. If the Trans-Mountain expansion is approved, oil tanker traffic out of Burnaby would increase from five to an estimated 34 ships each month. SLAVE LAKE, Alta. – A pipeline owned by Canadian Natural Resources Limited has spilled 70,000 litres of oil and processed water northwest of Slave Lake, Alta. The Alberta Energy Regulator says the breach happened on Monday and was reported by CNRL (TSX:CNQ) the same day. The regulator says the spill is not an emergency, the oil is not near any people, water or wildlife, and a cleanup is underway. Although TransCanada’s Keystone XL tar sands pipeline has received the lion’s share of media attention, another key border-crossing pipeline benefitting tar sands producers was approved on November 19 by the U.S. State Department. Enter Cochin, Kinder Morgan’s 1,900-mile proposed pipeline to transport gas produced via the controversial hydraulic fracturing (“fracking”) of the Eagle Ford Shale basin in Texas north through Kankakee, Illinois, and eventually into Alberta, Canada, the home of the tar sands. Like Keystone XL, the pipeline proposal requires U.S. State Department approval because it crosses the U.S.-Canada border. Unlike Keystone XL – which would carry diluted tar sands diluted bitumen (“dilbit”) south to the Gulf Coast – Kinder Morgan’s Cochin pipeline would carry the gas condensate (diluent) used to dilute the bitumen north to the tar sands. “The decision allows Kinder Morgan Cochin LLC to proceed with a $260 million plan to reverse and expand an existing pipeline to carry an initial 95,000 barrels a day of condensate,” the Financial Post wrote. Increased demand for diluent among Alberta’s tar sands producers has created a growing market for U.S. producers of natural gas liquids, particularly for fracked gas producers. Oil spills at an oil sands operation in Cold Lake, Alberta have been going on for weeks with no end in sight, according to a government scientist. Photos provided by a government scientist show the site of an oil spill in Cold Lake, Alta. The company that runs the operation says it is effectively managing the cleanup. Oil spills at a major oil sands operation in Alberta have been ongoing for at least six weeks and have cast doubts on the safety of underground extraction methods, according to documents obtained by the Star and a government scientist who has been on site. 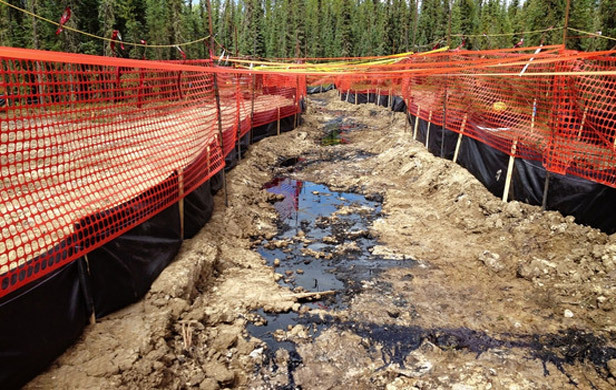 Canadian Natural Resources Ltd. has been unable to stop an underground oil blowout that has killed numerous animals and contaminated a lake, forest, and muskeg at its operations in Cold Lake, Alta. The documents indicate that, since cleanup started in May, some 26,000 barrels of bitumen mixed with surface water have been removed, including more than 4,500 barrels of bitumen. The scientist said Canadian Natural Resources is not disclosing the scope of spills in four separate sites, which have been off bounds to media and the public because the operations are on the Cold Lake Air Weapons Range, where there is active weapons testing by the Canadian military. The company says it is effectively managing and cleaning up the spills. “The areas have been secured and the emulsion is being managed with clean up, recovery and reclamation activities well underway. The presence of emulsion on the surface does not pose a health or human safety risk. The sites are located in a remote area which has restricted access to the public. The emulsion is being effectively cleaned up with manageable environmental impact,” the company said in a statement. 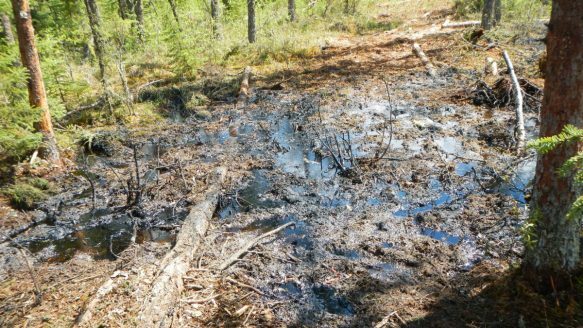 The documents and photos show dozens of animals, including beavers and loons, have died, and that 30,600 kg of oily vegetation has been cleared from the latest of the four spill zones. The company’s operations use an “in situ” or underground extraction technology called “cyclic steam stimulation,” which involves injecting thousands of gallons of superhot, high-pressure steam into deep underground reservoirs. This heats and liquefies the hard bitumen and creates cracks through which the bitumen flows and is then pumped to the surface. The scientist, who asked not to be named for fear of losing their job, said the operation was in chaos. In response to emailed questions from the Star, Canadian Natural Resources said it was co-operating with the regulator. Staff Sgt. Kevin Morton tries to help Jeff Langford, green shirt middle, with Ian Scheelar, left and Greg Kvisle come up with a plan to help him get some answers. Evacuees confronted the RCMP on the northwest corner of town in a bid to enter the Town of High River on Thursday, June 27th 2013, one week after the Highwood River flooded leaving the whole town empty. The protest stopped after and hour and a half but plans are to make it bigger on Friday. Evacuees, including Bob Michouluk Sr., confronted the RCMP on the northwest corner of town in a bid to enter the Town of High River on Thursday, June 27th 2013, one week after the Highwood River Flooded leaving the whole town empty. RCMP laid a spike belt down across the road to prevent them from travelling down it. RCMP revealed Thursday that officers have seized a “substantial amount” of firearms from homes in the evacuated town of High River. “We just want to make sure that all of those things are in a spot that we control, simply because of what they are,” said Sgt. Brian Topham. That news didn’t sit well with a crowd of frustrated residents who had planned to breach a police checkpoint northwest of the town as an evacuation order stretched into its eighth day. The Mounties confirmed they had taken guns from homes as officers searched homes in High River’s flood zone to look for flood victims, pets and anything that might pose a threat to returning residents. An RCMP official said any guns removed from homes were not properly stored. In a statement released Friday, the force said officers found that some gun owners had laid out their weapons in plain view as they presumably moved valuable possessions to higher ground. The weapons were tagged for return to their owners. “The last thing any gun owner wants is to have their guns fall into the wrong hands. Residents of High River can be assured that firearms now in possession of the RCMP are in safe hands, and will be returned to them as soon as is practically possible,” said assistant commissioner Marianne Ryan. That angered High River residents, who have been anxious to return to their homes to assess flood damage. An evacuation order for the town of about 13,000 residents was in its ninth day Friday, although it was announced some homeowners were being allowed to return Saturday. The seizure generated opinions on all sides, including from the highest political office in the land. “We expect that any firearms taken will be returned to their owners as soon as possible,” said Stephen Harper’s press secretary Carl Vallee. “This … is further proof that the RCMP have a not-so-hidden agenda to take guns away from responsible gun owners,” said Bernardo, who also sits on the federal public safety minister’s firearms advisory committee. Alberta Premier Alison Redford said she was disappointed to face questions about the gun situation. She suggested there were more important issues to deal with coming out of the flood disaster. “Let’s just make it very clear, the provincial government did not take away anyone’s guns,” Redford said. “The RCMP went in and secured a community that had been evacuated. And as part of that work, as I understand it, they went into houses where there were firearms that weren’t properly secured and, as opposed to leaving them sitting on fireplace mantles in a town that was evacuated, they secured those guns. OTTAWA — Aside from the great support offered by Canadian Forces personnel, the federal government has done nothing but get in the way during the Alberta floods, the president of the Alberta Fire Chiefs Association said Friday. In a candid interview with Postmedia News as he drove home to Lethbridge after a week in High River, where the worst of the flooding has occurred, Chief Brian Cornforth didn’t mince words as he slammed Public Safety Minister Vic Toews and his government’s response to the disaster, as well as its funding cuts to emergency preparedness. “The federal government, they can just stay in Ottawa. They got in the way,” he said, singling out Towes, who visited High River on Wednesday. Cornforth said the federal government talks a good game on public safety but hasn’t been much of a partner. He said he’s sickened by near daily reports of misspending at the “highest levels of government” when funding is being cut for things like emergency preparedness and urban search and rescue. Budget 2012 effectively slashed federal funding for the Joint Emergency Preparedness Program which has provided nearly $184 million to the provinces and territories for projects related to emergency preparedness, urban search and rescue and critical infrastructure protection since 1980. HIGH RIVER, Alta. – Some residents of flood-ravaged High River, Alberta, will be allowed to return to their homes on Saturday while others could be waiting at least another month, officials announced Friday. About 5,000 residents of the northwest part of town will be allowed to go back starting at noon, but Shane Schreiber of Alberta Emergency Management cautioned that not all of the 1,000 homes in the neighbourhood would be livable because of flood damage, and the phased re-entry of evacuees could take as long as five weeks for people from the most heavily devastated part of the town. Rick Fraser, the associate minister of regional recovery and reconstruction for High River said that some residents of High River received the green light to return to their homes Saturday while others will be able to tour the community by bus. “Our priority is to enable the return of residents to their homes in a safe and orderly fashion as quickly as possible, with a view to supporting further recovery and the long-term restoration of High River,” said Fraser. Bus tours were to start Friday night for all residents so they could at least get an idea of the damage. Also on Friday, the Alberta government declared a provincial state of emergency in High River and assumed responsibility for flood recovery and rebuilding operations, at the request of the town’s mayor. Municipal Affairs Minister Doug Griffiths said there has been more significant infrastructure damage in the town than ever suffered anywhere else in the province in any kind of disaster. Griffiths said power was starting to be restored, engineers were identifying which roads were safe and health and home inspectors were on the job. Mayor Emile Blokland said the floods have been overwhelming and that it’s best if the province co-ordinates getting the community’s 13,000 people back into their homes. “It’s become clear that the size and scope of this disaster is beyond anything we’ve ever seen before in Alberta,” Blokland said at the same update in High River. Shreiber said it would be three to five days before the next group of homeowners would be allowed in, five to seven days for the group after that and three to five weeks for people from the hardest hit section. Flash Flood in Canada on Thursday, 20 June, 2013 at 04:51 (04:51 AM) UTC. At least three people have been killed and more than a 100,000 forced to flee their homes as floods triggered by torrential rain hit western Canada. Officials have ordered the evacuation of the centre of Calgary, Alberta, after both rivers that flow through it, the Bow and Elbow, overflowed. The floods have washed away roads and bridges, cut-off electricity and submerged hundreds of homes. Canadian Prime Minister Stephen Harper toured flood-damaged areas on Friday. He has promised federal assistance for those affected. Royal Canadian Mounted Police Sgt Patricia Neely confirmed that three people were dead and two bodies had been recovered. She said the bodies recovered are of two men found in the Highwood River near High River, about 40 miles (64km) south of Calgary, on Thursday. “This is incredible,” said Mr Harper, a Calgary resident. “I don’t think any of us have seen anything like this before. The magnitude is just extraordinary.” Alberta Premier Alison Redford warned residents should be prepared for more flooding downstream. Communities further south were under total evacuation orders. Roughly half the homes in High River were flooded. While an estimated 230,000 people live and work in central Calgary, officials believed there would be few people to evacuate because many did not come to work on Friday. Some 25 neighbourhoods in Calgary, a city of one million, had already been evacuated. An estimated 75,000 residents have been ordered out of their homes. 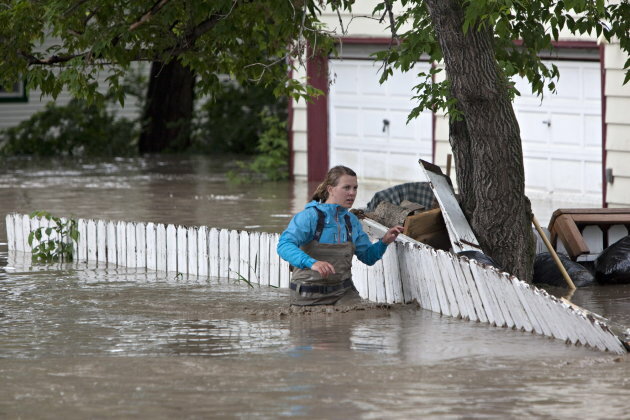 The floods come after a rainy week in Alberta, capped by 4in (10cm) of downpour on Thursday. Military helicopters rescued about 30 people off rooftops in the Calgary area. At least 350 soldiers are being dispatched to the flood zone, according to the defence minister’s office. The mountain resorts of Banff and Canmore were left isolated after the Trans-Canada Highway was closed. Calgary was dealing with a double whammy of overflowing water from two rivers that run through the city and converge downtown. An estimated 75,000 residents in 25 neighbourhoods along the rivers had been ordered out of their homes and, early Friday afternoon, that order was extended to the entire downtown. With evacuations from surrounding communities added in, the total number reached 100,000. City officials confirmed water had swamped the interior of the Saddledome, home to the NHL’s Calgary Flames. “We have reports that – yes – it is up to the 10th row in the Saddledome and … I think that really paints a very clear picture of what kinds of volumes of water we are dealing with,” said Trevor Daroux, the city’s deputy police chief. Water turned the nearby Stampede grounds into a muddy lake, lapping at the roofs of the chuckwagon barns. Nenshi said the city still hopes to be ready for the world-famous Calgary Stampede, which begins in two weeks. In communities along the rivers, residents were left to wander and wade through streets waist-deep in water. Mission resident Patty Thille, who lived in Halifax when Hurricane Juan hit in 2003, said her home is dry – astonishing, as it is only 100 metres from the Elbow river – but she has seen some amazing scenes. As record flood waters receded in parts of southern Alberta, Canada, residents in another section of the province braced for the wrath the raging waters would bring. Some 65,000 residents got the all-clear to return home in Calgary, although the situation was far from settled in the inundated city. “We are certainly still in a state of emergency, and as always our number one priority is people’s safety,” Mayor Naheed Nenshi said at a news conference carried Sunday by CNN affiliate CTV. “Stay away from the rivers … the riverbank could wash away from under you in an instant … it may look safe, it is not safe.” While 90% of the city’s hard-hit downtown area is expected to be open by Tuesday, some pockets of the city center may take weeks to return to normal, he said. “The city of Calgary took a pretty hard hit, but we’re a resilient city,” said Bruce Burrell, director of the Calgary Emergency Management Agency. “We want to recover as quickly as possible, we want to get people into their homes and businesses as quickly as possible, we want to restore the city as quickly as possible.”While conditions were improving in Calgary, the city of Medicine Hat cast a wary eye on the South Saskatchewan River, which authorities predicted would reach its peak Monday morning and flood at record levels. City Hall was lined with sandbags. Officials had told residents they should plan for the Trans-Canada Highway bridge to close Sunday night, but it remained open, allowing critical public access between the northern and southern sections of the city. Nearly 10,000 people have been evacuated in Medicine Hat, and almost everyone has complied with evacuation orders, said the city’s mayor, Norm Boucher. City spokeswoman Brandy Calvert said officials expect the flood to eclipse one that took place in 1995, the city’s biggest on record. So far, water treatment and power plants in Medicine Hat are protected. The drinking water is safe. “We don’t want to anticipate the worst, but we’re going to be prepared for the worst,” Alberta Premier Alison Redford said. “We know that, from what we’ve seen everywhere else, that this is more exceptional than we’ve ever seen in Alberta before, so we’re presuming that that’s probably the circumstance that we’re looking at (in Medicine Hat) as well.” The extensive flooding that has deluged towns and threatened southern Alberta communities has killed at least three people, officials said. The victims were all found in the Highwood River, about 40 miles south of Calgary. As the truck rattles to a stop, Siksika Chief Fred Rabbit Carrier looks out over the flooded community of Chicago Bridge where houses sit amid floodwater like islands. Severe flooding has forced around 1,000 Siksika people from their homes on the Alberta reserve, a large portion of which hugs a stretch of the Bow River about 100 kilometres east of Calgary. The disaster has been unfolding there since Friday, when the river poured over its banks and covered some areas with over a metre of floodwater. “How are we going to recover from all of this is what went through my thoughts,” Chief Rabbit Carrier told CBC News on Sunday. “Thereâs a sense of hopelessnessâŚ as a leader you have to overcome that and put emotions aside and start working toward the recovery.” Chief Rabbit Carrier said the community is still in a state of emergency. The reserveâs recreation centre has been turned into a shelter where a list of items – baby formula, diapers, towels, blankets and non-perishable food – are in high demand. The phone in the centreâs main office rings constantly.”We’ve been very fortunate that we have not lost anybody,” Chief Rabbit Carrier said. In the lobby, a group of volunteers hoping to rescue animals trapped in the flood gets organized. Theyâve already saved several animals, but plenty of barn animals and pets alike have perished. “If it has a pulse, weâll save it,” one volunteer said. Sally Fox, who has lived on the Siksika reserve for her entire life, refused to go to the emergency shelter, opting instead to sit at a makeshift campsite on the hill overlooking her flooded blue house. In Little Washington, thereâs almost a kilometre-wide swath of flowing water still covering the community. Residents say it could be weeks before the community is dry. Even then, most of the 45 houses here likely wonât be saved. The four Siksika communities – a popular golf resort on the reserve was also destroyed – hit hardest all sit on low-lying land, nestled beneath foothills. Little Washington residents checking on their homes said there has been some flooding in the past, but itâs never been more than a little water in the basement – not even during the major floods of 2005. Today the water is still moving quickly, gushing over a cracked Little Washington road on its way toward Medicine Hat. Chief Rabbit Carrier says he hopes his community can get into “recovery mode” in the next 24 hours. But he said he hopes when the water subsides, people donât forget about Siksika. With Alberta’s flood waters receding and the biggest cleanup in provincial history underway, the enormity of the economic damage is becoming apparent. Initial estimates from BMO Capital Markets insurance analyst Tom MacKinnon suggest total damages to homes, businesses, vehicles and other private property are likely to run between $3 billion and $5 billion. That’s roughly 20 to 30 times the amount of damage caused by southern Alberta’s last major flood, in 2005. Insured losses are expected to equal about 75 per cent of the final tally, or roughly $2.25 billion to $3.75 billion, MacKinnon said in a report issued Monday. Meanwhile BMO senior economist Robert Kavcic told the National Post the flood that left downtown Calgary underwater for days could shave 0.1 per cent or $2 billion off Canada’s economic growth in June. Forgone tourist dollars could inflate that total, he warns. The Calgary Stampede, which injects well over $300 million into the city’s economy, is set to start in just 10 days. CALGARY — The Alberta government is approving $1 billion to kick start the first phase of flood recovery in the province. Premier Alison Redford says the money will be used to support people who have been evacuated, as well as to run relief centres and to start rebuilding infrastructure. The government says it will provide pre-loaded debit cards to displaced residents to help with their immediate housing needs and day-to-day purchases. Those who qualify will receive $1,250 per adult and $500 per child. Redford says the unforeseen expense means Alberta won’t meet its plans to balance the budget in the coming years. CALGARY — Calgary’s mayor says almost everyone in the city who fled last week’s flood can return home. Naheed Nenshi says only people who live in the downtown area and in a small area in the Inglewood neighbourhood east of the city’s downtown are still being kept out. Nenshi says people should stay away from the closed section of downtown so that the area can be re-opened as soon as possible. He’s warning that people need to be cautious as they return — many houses won’t have utility service. About 75,000 people fled their homes last week as water spilled from the Bow and Elbow rivers, flooding many neighbourhoods. Nenshi urged people to keep their spirits up as their neighbours experience the pain of returning to damaged homes. He said he understood their frustration, but explained that the town’s infrastructure had suffered a “critical blow” and every house needed to be inspected. 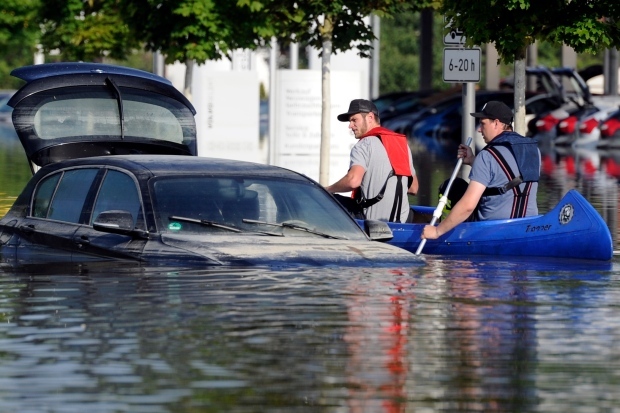 Canada gets hammered with flooding . Putting 100,000 residents on alert that they may have to leave Calgary. At least one person is missing in Alberta because of the severe weather. Flood waters trapped customers in one store, fire officials were called in to rescue them. The situation could get worse before it gets better. A rainfall warning has been issued for Calgary and Alberta , estimating as much as four inches of rain could fall within the next 2 days. A tornado warning issued in Cypress County in the southeast corner of Alberta has ended, but the area saw plenty of rain, hail, wind and severe thunderstorms. Meteorologists had been tracking a possible tornado on doppler radar five kilometres north of Elkwater, according to Environment Canada. It was part of a severe rotating thunderstorm that also has the potential to produce large hail, strong wind gusts and heavy rainfall. Another tornado warning issued for the County of Forty Mile near Manyberries has also ended. Environment Canada says the storm created a funnel that was spotted near the southwest shore of Pakowki Lake at 6:45 p.m. MT. Many areas of southern Alberta are under weather warnings tonight. Severe thunderstorm warnings have been issued for Cypress Hills Provincial Park, Foremost, Cardston, Fort Macleod, Magrath, Lethbridge, Taber and Milk River. Rainfall warnings have been issued for Banff National Park, Airdrie, Cochrane, Olds, Sundre, Calgary, Crowsnest Pass, Pincher Creek, Waterton Lakes National Park, Kananaskis, Canmore, Okotoks, High River, Claresholm, Rocky Mountain House and Caroline. A torrential downpour that was in the forecast all day Wednesday came as promised, and itâs forced a state of emergency due to flooding in Canmore. Authorities in Canmore say that the rains have forced Cougar Creek to overflow and that waterway has now flooded Highway One, making any western travel extremely difficult. Both east and westbound lanes are closed and Bow Valley Trail is also shut down due to the flooding. Officials in Canmore are also concerned that a pedestrian bridge that runs across the swollen Cougar Creek is at risk of falling. All public schools in Banff and Canmore have also been closed due to the weather. To make matters worse, a mudslide has reportedly shut down all traffic in Highway One about 40 km east of Canmore. RCMP are now turning around all of the traffic in the area, saying that the closure could last for several hours. Two other mudslides have also cut off traffic in other locations. One slide has cut off Highway 40 to Canoe Meadows just south of the Fortress Gas Station in Kananaskis. Another, near Banff, has shut down many of the highways in the area. A local state of emergency has also been reported for Exshaw, in the M.D. of Bighorn. Media reports say that there is no access to Highway 1A east or west and that residents there should not use water unless absolutely necessary. A state of emergency has also been declared for High River. Calgarians are being urged to stay away from the city’s downtown core, and all public and Catholic schools are closed Friday as river water levels are projected to rise throughout the night, with the city bracing for the overland flooding expected this morning. The bulk of evacuations for up to 100,000 people living in low-lying areas were expected to be completed overnight – with police and city officials urging workers to stay away from Calgary’s corporate towers, including a number of downtown blocks expected to be evacuated – and be careful around river banks and bridges. Many of the evacuees won’t be able to return home until at least Saturday. The city’s main homeless shelter was evacuated late Thursday, the city issued warnings about public transit interruptions, and the main downtown health emergency centre has been closed. “If you don’t need to be downtown, please don’t go downtown,” Calgary Police Service Deputy Chief Trevor Daroux said. Although only a few neighbourhoods were experiencing overland flooding late Thursday night, Dan Limacher, Calgary’s director of water services, said city residents could wake up to a different city on Friday. Water flows are eight to nine times higher than normal at this point in June, he said. “Tomorrow morning, we will see a lot more water in the city than we see tonight.”As sporadic rain continued, Mr. Limacher said river flow on the Elbow River will peak between 3-5 a.m. today, and the city’s largest river, the Bow will stop rising at that time — but maybe not go down as significantly as the Elbow River will. Mr. Limacher emphasized that the city’s drinking water shouldn’t be affected by the flooding. City officials said a few people were refusing to leave their homes but power and natural gas supplies are being cut in areas where the mandatory evacuation orders were issued. Traffic at evacuation centres was light as most people found a temporary bed at a friend or family member’s home. The disaster unfolding in Calgary was part of wider flooding that played out across southern Alberta Thursday, as flash floods hit the community of High River south of Calgary, a tiny creek became a deluge that washed away yards and fences in the mountain town of Canmore, and debris in rushing water triggered a sour gas leak in Turner Valley, south of Calgary. “It’s actually one of the most significant flood events this city has ever experienced,” alderman John Mar said in an interview. “This is a state of emergency, the first in this municipality since the 1920s.” Alberta Municipal Affairs Minister Doug Griffiths arrived at the city of Calgary’s emergency centre late Thursday, telling reporters that government is coordinating activities. He said the Canadian military may be called, in some specific instances, to help. Mr. Griffiths said emergency crews would continue to work through the night “to make sure that Albertans are safe, and try to protect as much property as possible as the situation unfolds.” Justin Thompson, his wife and two young children were given less than an hour’s notice to evacuate from their low-lying Sunnyside home in inner city Calgary Thursday evening. After dropping his family at his in-laws’ higher ground house, he returned to his own home to retrieve crucial documents from the basement. “I am surprised how close the river is from the top of banks right now,” he said while surveying the Bow River from a nearby hill. “I’ve never seen it this high. It’s pretty wild.” City officials said the water levels seen in Calgary are three times as bad as the floods that hit southern Alberta in 2005. They were forced to accelerate the pace of evacuation just before 7 p.m. after they were surprised by increasing water flow on the Bow River – after originally believing water levels would remain constant through the night – adding parts of two low-lying inner-city neighbourhoods to the evacuation orders. “This is not going to be an incident of hours, it’s going to be an incident of days,” said Chief Bruce Burrell, director of the Calgary Emergency Management Agency. In High River, the rise in water levels was so rapid that an evacuation centre itself had to be evacuated. One woman was missing after being swept into the Highwood River near the town. Okotoks, Calgary, Canmore, Lethbridge and Crowsnest Pass are among the towns that have declared states of emergencies and evacuated some residents. The Canadian Forces dispatched helicopters to rescue residents stranded on rooftops and clinging to treetops. Barbara Mathies, who lives in Elbow Park, said she was “a little panicky” after learning from her neighbour about the order to flee. She and husband Richard Emmer made plans to stay with a local friend, whose husband was stranded in Banff by flooding and highway closures. “I just called Richard to say, âPlease can you come home?’ Because I need some help to decide what to pack. It might be three days, and rumour has it that our electricity might be turned off, so I need to figure out what I’m going to do with the stuff in my fridge – just little things like that,” Ms. Mathies said. The Calgary Zoo, through which the Bow River flows just east of downtown, evacuated nonessential staff as the city closed two bridges that provide access. The facility closed on Thursday and will remain shut Friday. “Our animal care team, along with our facilities department, will continue to monitor the situation throughout the night and into tomorrow,” spokeswoman Larissa Mark said. “They will be taking all necessary precautions should the island experience any flooding. Our animals will be moved to higher ground and into sheltered spaces for protection.” Calgary Mayor Naheed Nenshi made a plea for residents to stay clear of the flood zones as waters rose. 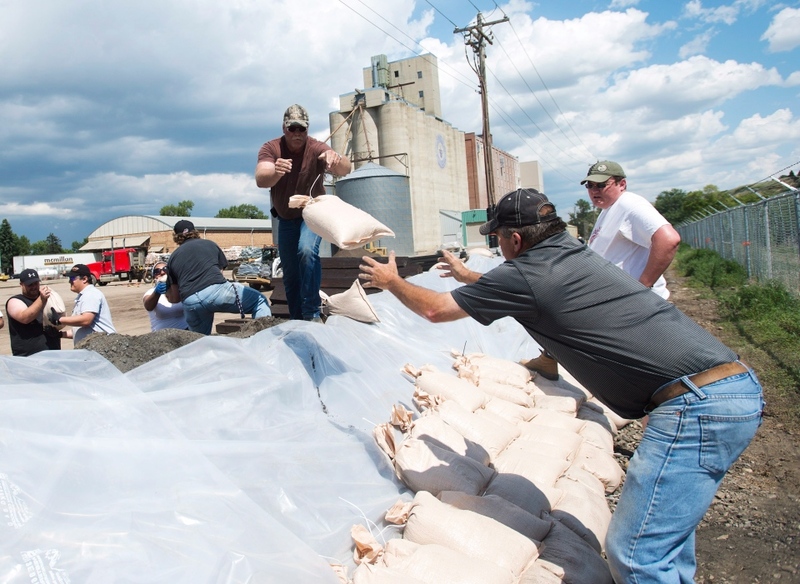 “We’ve got lots of people out there sandbagging and berming. We need the assistance of the community in this, both in staying away from the riverbanks and assisting where they can with their neighbours,” Mr. Nenshi said following a lunchtime speech in Toronto before getting on a plan back to Alberta. “If you don’t live near the river and you can offer a place to stay for friends and family, that would be a very good thing.” The Calgary Board of Education closed six schools in potential flood zones for Friday. In Turner Valley, another town just south of Calgary, a pipeline carrying dangerous sour natural gas broke open because of the natural disaster. 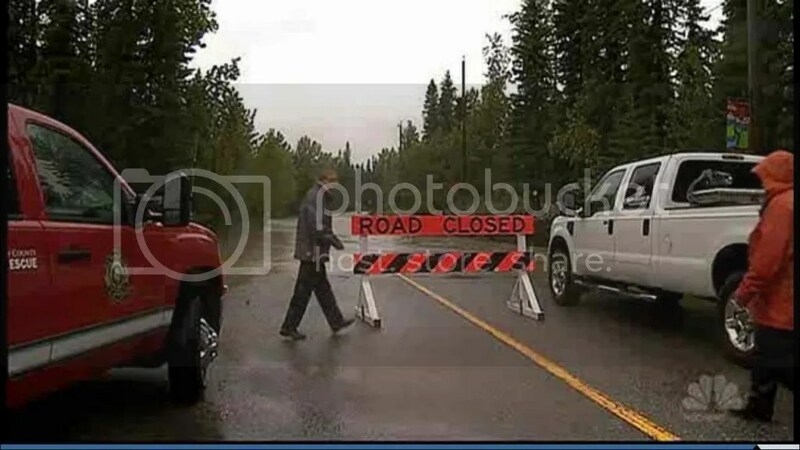 Highways accessing Canmore were closed, isolating the Rocky Mountain community. Nearby Banff is in better shape, with no expectation of flooding and no danger of mudslides reaching the town, although all roads into the internationally famous tourist destination were closed on Thursday evening. 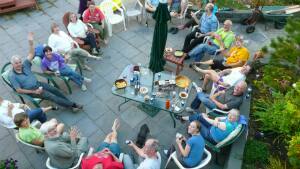 Alberta’s first cohousing community is preparing to celebrate its 10th anniversary this weekend. Prairie Sky Cohousing Cooperative — home to more than 40 people — sits on a large lot in Winston Heights where a single family home once stood. There are now 18 units spread among three buildings that are fully equipped townhouses or apartments. Residents also share common spaces, including a 3,200-square-foot common house with a kitchen, dining room and lounge where community members gather for shared meals, recreation and other events. With the Italian real estate market in free fall, increasing numbers of people are tumbling through the gaps. Too rich to claim social housing and too poor to afford a traditional house, some are turning to a new approach—cohousing. The basic idea is to combine in a condominium the autonomy of a private house with the benefits that come from sharing space and resources such as a garden, gymnasium, laundry, gardens, and children’s day care. The whole project is collectively designed and chosen by those who will live in those spaces. A bizarre technicality has allowed Exxon Mobil to avoid paying into the federal oil spill fund responsible for cleanup after the Pegasus pipeline released 12,000 barrels of tar sands oil and water into the town of Mayflower, Arkansas. Legislators are quick to point out why the Tar Sabds Crude is necessary. It is unfortunate for those who are not making money on this deal as we have all been shafted by these crooks who call themselves Public Servants. They were quick to get this deal approved ASAP, but no one took into consideration that the Oil Company would use any excuse at their disposal to get out of shouldering their responsibility were a tragic accident to occur. Lo and behold here we are with this terrible spill and Exxon has found a loophole in an existing law on the books that legislators did not bther to close. Doesn’t it just make you all warm and fuzzy to know that they are taking care of us?……NOT!! I say we look for those who were so vehement about the importance of this deal to go through and put them to work cleaning up this spill. Since Exxon has been given a free pass via their incompetence…… Hmmmmm, Tar and Feathers are looking really , really good about now . As Think Progress has just reported, a bizarre technicality allowed Exxon Mobil to avoid paying into the federal oil spill fund responsible for cleanup after the company’s Pegasus pipeline released 12,000 barrels of tar sands oil and water into the town of Mayflower, Arkansas. News that Exxon was spared from contributing the 8-cents-per-barrel fee to the clean-up fund added insult to injury this week as cleanup crews discovered oil-soaked ducks covered in “low-quality Wabasca Heavy Crude from Alberta.” Yesterday officials said 10 live ducks were found covered in oil, as well as a number of oiled ducks already deceased. The central Arkansas spill caused by Exxon’s aging Pegasus pipeline has reportedly unleashed 10,000 barrels of Canadian heavy crude – but a technicality says it’s not oil, letting the energy giant off the hook from paying into a national cleanup fund. At least legally speaking, diluted bitumen like the heavy crude that’s overrun Mayflower, Arkansas is not classified as ‘oil.’ While the distinction might normally not mean much, in the case of the disastrous spill in Arkansas it ensures that ExxonMobil will not have to pay into the federal Oil Spill Liability Trust Fund. According to ThinkProgress, which has brought attention on the strange legal exemption, ExxonMobil has already confirmed that the compromised pipeline was transporting “low-quality Wabasca Heavy crude” from Canada’s Alberta region. That particular form of crude must be diluted with lighter fluids to evenly flow through a pipeline – it also contains large quantities of bitumen (commonly known as asphalt). The end result is that both the US Congress and the Internal Revenue Service do not consider tar sand oil as oil at all, and thus exempt any company transporting the crude from paying an $0.08-per-barrel tax – which is the primary source of cash for the federal government’s oil spill cleanup fund.